We also offer Phone and Internet bundles that save you money and provide more fearures than traditional phone service. For a limited time, get a free ATA rental on any phone and Internet bundle. click here for more info. 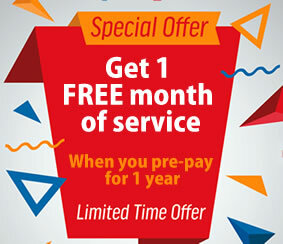 For a limited time only, get 1 free month of service when your prepay for the whole year! Available on all Internet plans in your region. Select the Free Month promotion on any plan during the ordering process. 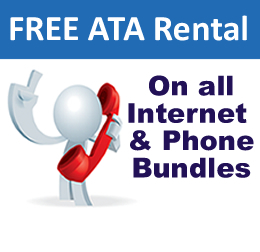 Get Free ATA rental with any Internet and Phone bundle and save $60 per year! A Free ATA rental, a value of $5/month, will be provided on all orders of our digital phone service when bundled with any DSL or Cable Internet plan. Available on all Internet and phone bundles in your region. - All plans include cable modem rental. - Anti-virus and SPAM filtering on all emails. - Installation 10 business days. - Move fee: $75 with 3 weeks prior notice. Cable Internet does not require an active cable television access. If none exists, one will be installed with the service at no extra charge. Overage on all packages that are not unlimited* will be charged at $0.50/GB to a maximum of $50/month. *Plans that have a download speed of 50Mbps or more are not subject to the $50/month overage cap. Prices subject to change without notice. Prices do not include applicable taxes. **A 30 day notice will be given in the event the promotional plan is discontinued or if there is any change in price.